Juice making | Infonet Biovision Home. Short description: This datasheet contains a description of different types of drink made from fruits. Also includes a step by step guide of juicing and preservation. Those that are used little by little from bottles which are stored between use. The former groups should not require any preservative if they are processed and packaged properly. However, the latter group must contain a certain amount of permitted preservatives to have a long shelf-life after opening. Syrups - Are concentrated clear juices. They normally have a high sugar content Each of the above products is preserved by a combination of natural acidity, pasteurisation and packaging in sealed containers. 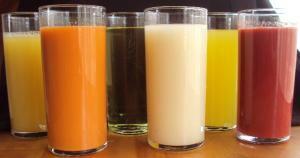 Some drinks (syrups and squashes) also contain a high concentration of sugar which helps to preserve them. Vile ambavyo vinaweza kutumiwa punde tu baada ya pakiti zao kufunguliwa. Vile vinavyochoviwa kidogokidogo kutoka kwenye chupa na hatimaye kuhifadhiwa baada ya kutumiwa. Kundi la kwanza halihitaji kiungo chochote cha kufanya vinywaji hivyo vidumu iwapo vimeandaliwa na kupakiwa vizuri. Hata hivyo, kundi la pili la vinywaji lazima liwe na kiwango fulani cha kemikali kilichoruhusiwa kuvihifadhi ili vidumu iwapo vimeandaliwa na kupakiwa vizuri. Aina mbalimbali ya vinywaji huwekwa katika makundi kulingana na utaratibu ufuatao. Fruits and vegetables can be categorised into soft pulpy e.g papaya, mango, peaches, avocado, tomato and hard e.g apples, pears, carrots, beetroot . Whilst most hard fruits/veg can be processed into both clarified "clear" juices as well as "nectar" pulp juices, soft pulpy fruits/veg are not so easy to produce clarified juices and are more commonly processed into fruit/veg nectars. 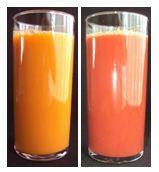 Almost all juices can be turned into concentrates. Selection of fruit/veg to use for juice is very important. They must be mature, clean and free from any mould, bruising or rot, they must also not contain any chemical or other contaminant residues. It is important to select a clean working space to process fruit and vegetables. This space may be in the form of a small kitchen, a small production facility or a larger processing facility. A potable water supply including hot water. Water quality is critical, if in doubt use boiled water or add one tablespoon of bleach to each gallon of water to sterilise it. If water is cloudy, a water filter should be used. No horizontal ledges, window sills, or rafters where dust, insects and bird droppings can collect. The processing area must be set up logically to ensure there is no risk of cross contamination within the processing space and operations. 1. Pre sorting - Fruit/veg arrives into a processing area by many means and in many packaging forms. Pre sorting ensures rotten and poor quality products are removed in the very early initial stages of processing. It is wise that this process of pre sorting happens outside of the hygienic confines of the production area to ensure there is no risk of cross contamination. Pre sorting personnel must also be subject to the hygienic regulations of the facility and must ensure that they do not create cross contamination via unwashed hands, dirty overalls or clothing and footware. 2.Washing - Washing of fruit/veg is carried out to remove all external debris and contamination. This is commonly the initial process carried out within the confines of the production facility and often food grade sanitising chemicals are used as sterilising agents. 3. Sorting - A final sorting is done to ensure there are no internal contaminants e;g worms or other bugs. For optimum efficiency this operation is carried out on sorting tables or moving inspection conveyor belts within the production facility. 4. Peeling and Seed removal - Depending on the scale of production, some fruits/veg require skins and seeds to be removed before processing: e.g. Mangoes, peaches, papaya, pineapples, avocado. 5. Cutting - Depending on the scale of production and machinery used for processing, some fruit/veg require cutting into optimal sizes for machinery or process used: e.g. mango, carrot, beetroot. This is a basic form of making juice without the help of any electrical machinery. The process is labour intensive and sometimes a less efficient extraction method. After steps 1 - 5 above, the following processes are carried out, depending on the fruit/veg type. Fruit/veg are squeezed or pressed using manual appliances. This system is efficient for very small scale restaurant production where volumes required are not very high. In the case of citrus, skins are not removed. This manual system is used for fruit/veg with small seeds e.g passion fruits. Steps 1 - 5 are followed as above before fruit/veg are subject to crushing, grinding or disintegration using various electrical appliances. Soft fruits/veg may be blended using commercial blenders resulting more often in "nectars" where the pulp remains in the final product. Fruits/veg processed like this often include mango, pineapple, papaya,tomato, avocado etc and also many combinations of these creating fruit "mixes" or "smoothies". 2. Crushing Juicy fruits with small seeds are often put through a process of crushing where the seeds, skins and unwanted pulp are removed from the final process. 3. Grinding Juices of fruits such as apples and pears are extracted through the process of grinding. 4. Centrifugation Centrifugation achieves a separation of particles in suspension in the juice. Many electric juices use this principle where fruit mass is spun at speeds of 6000 to 6500 RPM (rotations per minute) through a sieve that retains the seeds and unwanted pulp mass. Centrifugation can be considered as a pre-clarifying step. Commercial juicers crushes, grinds and centrifuges - especially good for pineapples and passion fruit. Fruit is pushed through the feeding mouth of the machine and is pulverised on a rotating disc before the pulp is spun against a very fine filter, thus fruits normally needing grinding and crushing can be juiced. The seeds and pulp are expelled from the side shute on the machine. N.B Citrus fruit are normally juiced using special citrus juicers as their skins contain oils that will create the juice to taste bitter. 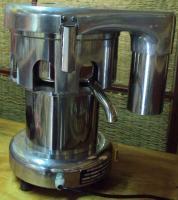 There are many types of electric citrus juicers on the market ranging from domestic use to commercial. Domestic citrus juicer good for limes, lemons, oranges, tangerines etc. When buying juicing machinery, be sure to look for models that produce a good yield of juice. The efficiencies of machines can have a huge impact on yield and thus potential income. 1. Enzyme treatment -To improve extraction yield , taste and colour fix of some juices, enzyme treatment with 2 - 8% pectolitic enzymes is used at 50oC for 30 minutes. However, for fruit which is naturally rich in pectic substances e.g citrus, this treatment makes the resulting "exhausted" material useless for industrial pectin production. 2. Heating of crushed fruit mass before juice extraction is an optional step used for some fruit in order to facilitate pressing and colour fixing; at same time, protein coagulation takes place. 3. Juice Clarification - can be performed by centrifugation or by enzyme treatment. Centrifugation achieves a separation of particles in suspension in the juice and can be considered as a pre-clarifying step. This operation is carried out in centrifugal separators with a speed of 6000 to 6500 RPM. 4. Enzyme clarifying is based on pectic substance hydrolysis; this will decrease the juices' viscosity and facilitate their filtration. The treatment is the addition of pectolitic enzyme preparations in a quantity of 0.5 to 2 g/l and will last 2 to 6 hours at room temperature, or less than 2 hours at 50deg C, a temperature that must not be exceeded. The control of this operation is done by checking the decrease in juice viscosity. Sometimes, the enzyme clarifying is completed with the step called "sticking" by the addition of 5 - 8 g/hl of food grade gelatine which generates a flocculation of particles in suspension by the action of tannins. 5. Filtration of clarified juice can be carried out with kieselgur and bentonite as filtration additive in press-filters (equipment). 1. Pasteurisation: This requires raising the temperature of the juices to 80 - 95degC for 1-10 minutes prior to filling hot. At the simplest level, this may be carried out in a stainless steel, enamelled or aluminium saucepan over a gas flame, but this can result in localised overheating at the base of the pan, with consequent flavour changes. To avoid the use of large expensive, stainless steel pans, a large aluminium pan can be used to boil sugar syrup. A given amount of the syrup is then mixed with fruit juice in a small stainless steel pan and this increases the temperature to 60 - 70degC. The juice/syrup mixture is then quickly heated to pasteurising temperature. 2. Preservation under CO2 pressure may be done at a concentration of 1.5% CO2 under a pressure of 7 kg/cm2. At the distribution step, proceed at CO2 decompression and the juice is then submitted to a sterilising filtration and aseptic filling in receptacles. 3. Preservation by freezing is carried out at about -30deg C, after a preliminary de-aeration; storage is at -15 to -20deg C.
Juices can be packaged in many different ways. Bottles, glass and plastic, tetra packs of different shapes and sizes, plastic pouches and even cups can be used. All packaging must ensure no leakages. In all cases, the products should be hot-filled. A stainless steel bucket, drilled to accept a small outlet tap, has proved to be a very successful filler. Output can be doubled quite simply by fitting a second tap on the other side of the bucket. This system can be used to produce 500-600 bottles of fruit juice per day. After filling hot, the bottles are capped and laid on their sides to cool prior to labelling. Note: Care is needed when producing pineapple juice due to a heat resistant enzyme in the juice. The enzyme damages skin after prolonged contact and workers should therefore wear gloves to protect their hands. The juice must be heated to a higher temperature for a longer time to destroy the enzyme (eg boiling for 20 minutes). Small scale production packaging can be done cost effectively with plastic bottles, plastic bags that need sealing, and cups that need sealing. For cups using the foil heat sealed lids is adequate and can be done cost effectively to begin with by using a hot iron before upgrading to a more commercial hand sealer. Pay particular attention to the quality of re-usable bottles, check for cracks, chips etc and wash thoroughly before using. If bottles are not able to be sterilized with hot water as in the case of plastic bottles, they can be sterilised in cold water using the sterilising agent Calcium Hypochlorite. The concentration of preservative should be carefully controlled for correct preservation of squashes and cordials, and may be subject to local laws. Check first and use accurate scales to measure the preservative. The temperature and time of heating are critical for achieving both the correct shelf life of the drink and retaining a good colour and flavour. A thermometer and clock are therefore needed. This information can be carried on independent stickers to be attached to the packaging or can be printed directly onto the packaging. 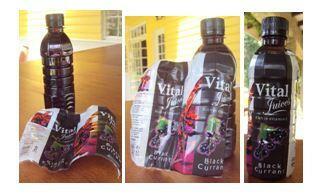 Shrink wrapping is used to ensure security on lids of products as well as for labelling. Heat in the form of hot air or hot water is used to shrink a plastic film around the top of bottles or entire bottles when used for labelling. The end products look very professional. The advantages of labelling this way allow one to purchase generic empty packaging as in bottle or cups and then label in batches as needed rather than going through the process and cost of labelling minimum volumes of printed packaging which can be prohibitively expensive for the small scale and start up produce. To shrink wrap, simply blow hot air using a device as simple as a hair drier or commercial blow drier onto the shrink wrap plastic held over the surface of the product to be covered. The plastic will shrink when it comes into contact with the heat and securely cover the mould over which it is being placed. Alternatively dip the entire product with the shrink wrap sheath into hot water for a few seconds, remove and dry. The shrink wrap sheet in the picture was heated onto the bottle whilst in a cylindrical shape. It was slipped over the bottle and subject to hot air that caused it to shrink into contact with the bottle surface securing it place.